Hairball, check in the fridge. Mittens- under the couch. Mouser and me we got the cooler. That beer's here somewhere, And we WILL find it. Too small for motorcycles,The Pufffballs Kitty Gang stalked their victims on paws. In this scene from the forthcoming all-cat remake of "The Hangover," the "Cat Pack" prepares to take Vegas by storm, unaware of the chaos that awaits them. We're on a mission from God...to locate the residence of sprite75 and take all his beer away! Hope you've got some tuna buddy. From left to right: Mr Brown, Mr White, Mr Orange and Nice Guy Kitty. We control the catnip market here bud, buzz off..
My army is better than Bart Simpson's. They operate during the day as well as the during the night. I can just imagine The Jingle Cats doing a cover of Link Wray's Rumble. 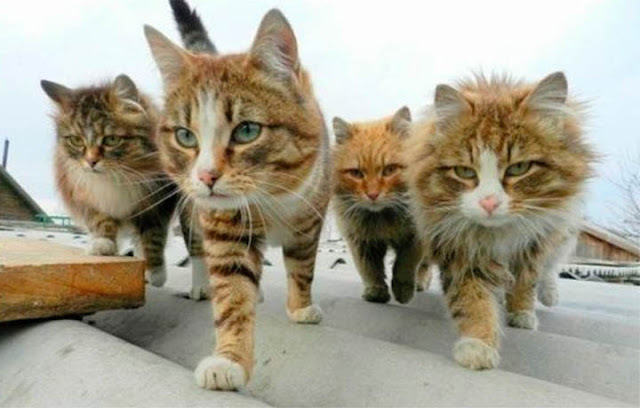 You came to the wrong neighborhood.....motherf**ker. An entire legion of my best cats await them!